Every weekend I buy 2 little containers of fresh basil pesto from Cesare. We often just treat it as a dip, tossed through pasta or on crackers with a pre-drink drink. I’ve discovered it’s also great thickly spread over chicken Maryland pieces and baked in the oven. So good! You’ll see in the photo that I also added yams that I’d bought from Arek to the oven dish. Season both sides of the chicken pieces. 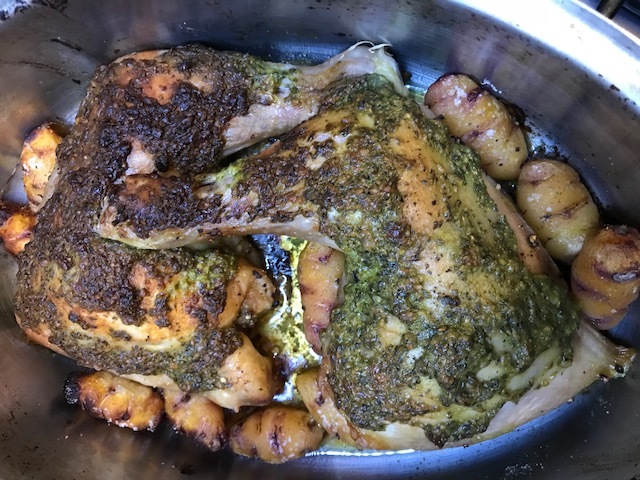 On the underside of the chicken pieces spread ½ the pesto thickly. Place the pieces in an oven dish pesto side down. Both the chicken and the yams take about 45 minutes till ready. With about 15-20 minutes to go take the dish out of the oven and put the rest of the pesto all over the top and sides of the chicken. Then finish the cooking. Don’t worry if the pesto browns it’ll taste absolutely fine and of course, yummy!